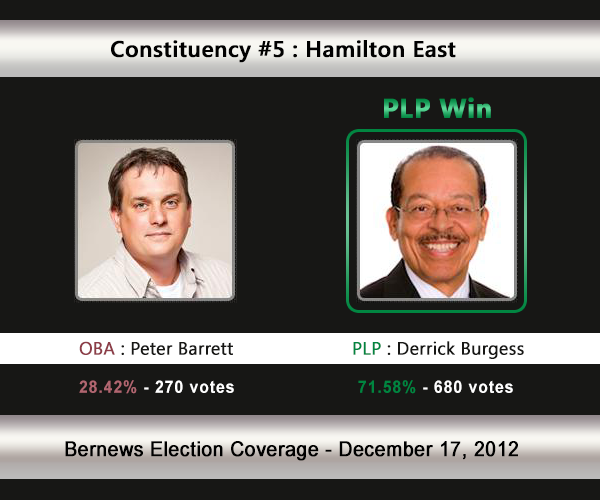 [UPDATE Dec 17: Election Results] Incumbent Derrick Burgess [PLP] has defeated Peter Barrett [OBA] in C#5 Hamilton East. Presently held by the PLP’s Derrick Burgess, this area is widely considered to be a ‘safe seat’ for the PLP. Mr Burgess will be challenged by political newcomer Peter Barrett from the OBA. Mr Burgess has held the seat since 1998. In the 2007 General Election, he won 80.28% of the vote vs the UBP’s David Sullivan [737-181]. In the 2003 General Election, Mr Burgess won with 72.94% of the vote against Keetha Lowe [UBP] who received 27.06%. 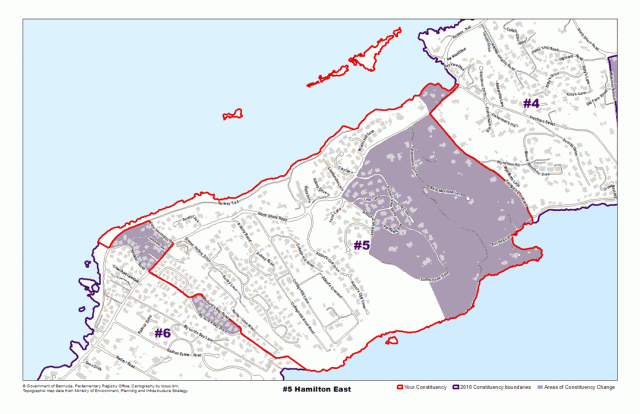 Areas Hamilton East includes, or is located by, include Redkiln Lane, North Shore Road, Abbot’s Cliff Road, Summit View Drive, My Lord’s Bay Road, My Lord’s Bay Drive and more. The Hon. Derrick V Burgess JP, MP, Deputy Premier and Minister of Public Works has had a long career in Bermuda’s hotel industry before assuming the full-time post of President of the Bermuda Industrial Union [BIU], one of the oldest trade unions in Bermuda. There he quickly enhanced his reputation as a fearless defender of the rights of workers in Bermuda. Locally, he was educated at Harrington Sound Primary School, and at Prospect Secondary School for Boys (also known as Cunningham’s). He earned a Diploma in Hotel Management from the Lewis Hotel School in Washington, D.C. and has pursued programmes of study at Bermuda College, the City College of Chicago, the University of Maryland, and the George Meany Labour College, Washington, D.C. He began his career as a busboy at the now defunct Coral Island Hotel, where he rose to the post of General Manager. He later worked at some of the best hotels in Bermuda receiving a number of promotions due to the high standard of his performance. His involvement in trade unionism began with his election as shop steward at the Holiday Inn Hotel. He steadily rose to prominence in the BIU, becoming President of the Hotel and Restaurant Division and later Vice President. In 1996, he became President, a position he held for ten years. In 2001, he was elected First Vice President of the Caribbean Congress of Labour, the first Bermudian to hold that position. He was first elected PLP Member of Parliament in a February 1998 by-election, and re-elected in November 1998 when the PLP swept to victory and formed the Government after thirty-five years in opposition. He has served on the Board of Immigration, the National Pension Plan Board and the Labour Advisory Council. He has also served as chairman of the Government Employees’ Health Insurance Scheme. On 1st September, 2006, he was appointed Minister of Labour, Home Affairs and Public Safety, with his Ministry re-configured as the Ministry of Labour and Immigration some three months later. On 20th December 2007, he was appointed Minister of Works and Engineering. His term as Minister of Labour and Immigration saw the enactment of the Bermuda Immigration and Protection Amendment Act 2007, representing the culmination of a comprehensive review of the law relating to land holding in Bermuda. He was elected Deputy Leader of the PLP and Deputy Premier on 28th October, 2010, and was named Minister of Public Works. In November 2011, he was named Minister of Transport. Mr. Burgess is a member of St. John A.M.E Church. He is the father of three and grandfather of six. Balancing optimism with realism, Peter Barrett believes whole-heartedly in the people of Bermuda while recognizing the realities currently facing its people. Eliminating gang violence, investing in job creation and creating opportunity for small business must go hand in hand with re-energizing tourism and ensuring quality education for our children. Uninterested in personal or political agendas, Peter knows that hard work, integrity and ultimately a government that puts Bermuda first, will be the key to progress. Peter wants solutions now and is prepared to knock on every door of the constituents of Hamilton East to get Bermuda back on track with a new OBA government. A life-long resident of Hamilton Parish, Peter is an astute businessman who after completing degrees at Acadia University (BA) and Dalhousie University (BComm) went on to acquire his Chartered Accountancy designation. Beginning his career with Copper & Lines and then working extensively in banking and fund administration, Peter possesses the business acumen and leadership skills necessary to move Bermuda forward. Having represented Bermuda at the Junior Squash championships in university, Peter now volunteers a considerable portion of his free time to the Bermuda Squash Racquet Association where he serves as Treasurer and a member of the Executive Committee. Peter works to help his church’s Loaves and Fishes program, and he also donates his time to Business Bermuda where he chairs the Administrators Sub-Committee. Peter joined the OBA because he believes it “offers Bermuda the change it needs to get back on track and bring about a brighter more secure future for the people of Bermuda.” He is looking forward to meeting all of the people of Hamilton East to promote their interests and raise their concerns in the House of Assembly.